Early this morning I ran down to Splash Point to mark the longest day. I had hoped to go further, to Firle Beacon perhaps, or even to the Long Man of Wilmington to see if I could join in any interesting fertility rites, but had to be in work early to open up for an exam board. There's something particularly good about running late in the afternoon at this time of year. I don;t think I have done so since last September, a a break from my hospital visiting duties. I went out to Firle Beacon again on Sunday, and was fast, I think as fast as I've ever run that route. I met few other people, a rambler and a cyclist. On Monday I ran round Stanmer park with Claire and Joanna. I have worked out that if I am to run the Beachy Head Marathon, I need to start training on 9 July and if I run La Rochelle, on 6 August. Yesterday I managed a short run round Stanmer park again, with Claire, Jana and Rainy, in spite of invigilation and meetings and the like. More unrecorded runs: on Friday with Jana, on Monday with Jana and the cocker spaniel Rainy. But the most important was Sunday's, an eight mile to Firle Beacon and back. It was fine, though misty in the distance, and I met the Exmoor ponies for the first time for some weeks. But the most charming sight was a herd of brown cattle, bull, cow and calves, a delightful family group. I found the running hard, but it is a week since the half marathon. Some smaller runs have gone unrecorded: two session of cani-cross, as the BSMS running club has now opened its doors to other species, Jana taking her cocker spaniel Rainy round Stammer Park last Friday and Monday, and on Wednesday I enjoyed a run with Claire, fresh from her triumph in the South Downs Way Relay on 2 June. 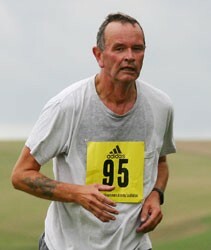 I promised a fuller account of the Seaford Half, run last Sunday, 3 June. We started at the usual place on Bonningstedt promenade at 9 am in fine hot weather. I started near the front and found myself going too fast as I matched pace with the faster runners around me, but slowed myself as we went through Bishopstone. The first hills were not too bad, but I began to feel the ill-effects of the virus I’d be struggling with for the past two weeks. After Fiveways, the route goes down to the bottom of the valley and then offers a long hard climb. I am afraid to say that , for the first time of the four I have run this race, I walked up the hill, but my time still looked good and I thought I should not rule out finishing in under two hours. From this point the running was easy, along the tops of the downs and down to Alfriston. I found myself running near a singing runner, who bellowed discordantly the vocal line to the song his iPod was playing. Alfriston is half-way, but then comes a long slog along the Cuckmere valley. the surfaces are uneven, hard to run along, and I fell at one point; I was slower now and began to realise that finishing in under two hours was no longer possible. After crossing the A259 at Exceat we ran out a little further toward the mouth of the Cuckmere and then, after a witty sign saying ‘all uphill from now,’ took on an ascent to a farmyard, and then another up a cart track to the top of Seaford head. A short run along the top of the cliffs lead to a steep descent of Seaford head to Splash Point, and the final mile to the finish. I had little strength left, but managed a short sprint at the very end. The results are here [Word file], and there are some photographs here. I ran yesterday morning what might turn out to be my last ever TAG.